Note: This is a limited edition or made-to-order product. Please call before ordering at: 1-800-425-6257 or 212-579-4576. The Kieninger Riva Regulator Grandfather Clock reinterprets the grandfather clock category with many innovative design features. 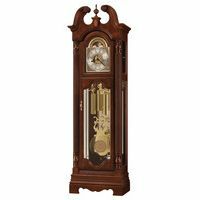 Grandfather clocks today are connected with classical, antiquated forms and ages. The concept clock Riva model newly interprets the grandfather clock category with many innovative design features. The design language stands for a feeling of lightness combined with enjoyment from a period of change and confidence. The Riva design brings this feeling to the present day. 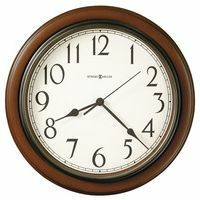 The clock conveys the passion for quality in materials and workmanship, and convinces with the use of modern, innovative and high quality clock technology. The body is made from solid mahogany, fine veneers and innovative wood materials and floats on an asymmetric, upwardly tapered base. Polished stainless metal bands running parallel to the edges of the case at even intervals and form a stylish contrast to the elaborate piano finish quality mahogany surface. Matching this the glass work is fitted in polished stainless metal bands. The movement is illuminated through an arched breakthrough on the top and a pair of LED lights with sensor control. An additional pair of LED focuses on the soothing pendulum swing. Nothing remains hidden. The use of 2 drawers in the base enhances appearance and functionality. 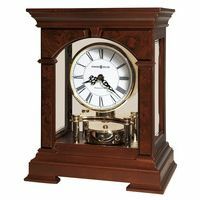 A removable, freely positioned mantel clock can show a second time zone and has an independent LED illumination of its dial. Wing doors on both sides and the chrome plated brass tube are catching function and style elements. Both movements feature a milled, matt chrome finish dial ring with polished brass indicators. The edition of this clock masterpiece is limited to 50 pieces. Technical data of this Floor clock with Oval Base with Caliber ZSO02 precision cable movement with central second, selected, ground and chrome plated plates with diamond cut edges and gold plated wheel set. Graham-style deadbeat escapement. 1 month run time and an above average precision of 5 seconds per month can be reached. 8 ball bearings and 6 ruby jewels. Power reserve (during winding procedure), winding stop. Fine beat adjustment. Precision carbon stick pendulum with temperature compensation and fine adjustment. Removable Mantel clock H 17.5 x W 29 x D 14.5 cm Caliber NET03 keywind movement with open tourbillon. 7 day run time. 6 ball bearings and 13 ruby jewels, winding and adjustment from back. This is a limited edition or made-to-order product. Please call before ordering at: 1-800-425-6257 or 212-579-4576.